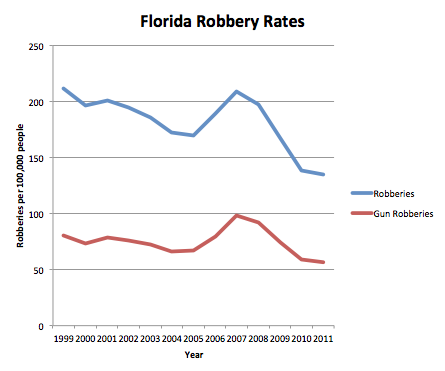 John Lott's Website: Soros funded Florida Center for Investigative Reporting claims: "As Firearm Ownership Rises, Florida Gun Murders Increasing"
Soros funded Florida Center for Investigative Reporting claims: "As Firearm Ownership Rises, Florida Gun Murders Increasing"
Murders by firearms have increased dramatically in the state since 2000, when there were 499 gun murders, according to data from Florida Department of Law Enforcement. Gun murders have since climbed 38 percent — with 691 murders committed with guns in 2011. Only partial numbers are available for 2012, but from January to June, there were 479 murders in Florida — 358 of them committed with a gun. 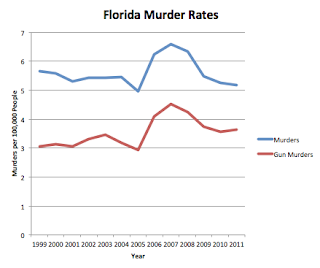 That’s an 8 percent increase in gun murders compared to the same period in 2011. 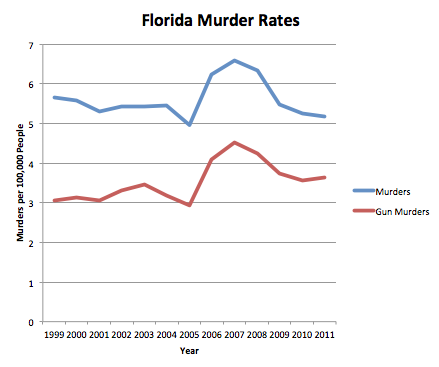 Guns are now the weapons of choice in 75 percent of all homicides in Florida. That’s up from 56 percent in 2000. . . . . 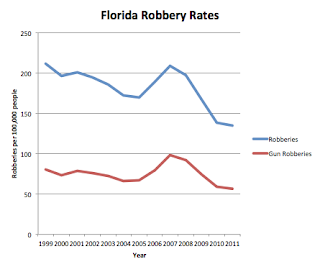 Note that they could also have looked at robberies and aggravated assault rates with guns and they would have seen drops of 23 and 11 percent respectively. If they had looked at murder rates with guns, those rose by 16 percent, versus the rate that they reported that didn't adjust for population growth of 38 percent. Given that crimes can be deterred with guns, it seems to me that one will want to look at primarily at total murders, robberies and aggravated assaults. 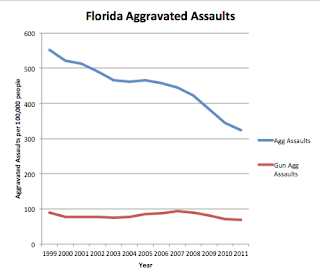 Even more interestingly, gun sales have soared in Florida since 2008 and all the rates, both with and with out guns, fell since then. The crime data is available here. 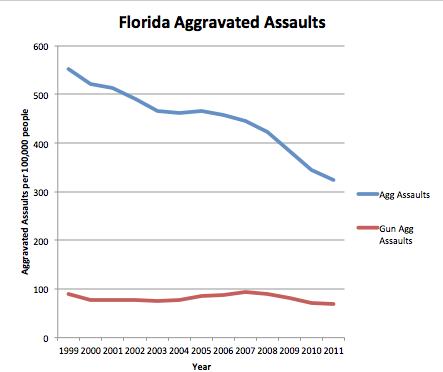 Unfortunately, mainstream newspapers such as the Miami Herald and the Lakeland Ledger pick up this report. Take a look at the fast-growing number of Soros-funded centers - they are blooming everywhere, like tulips in the spring, the Colorado Center for Investigative Reporting, the New England Center for Investigative Reporting, the Florida Center for Investigative Reporting, the Philippines Center for Investigative Journalism and on and on - and even a cursory look at the selected subjects shows an amazing similarity. . . .
UPDATE: The FCIR lists funding sources here. Note however that Soros and his OSI have given money to the Center on Media, Crime and Justice and that the Fund for Investigative Journalism has received money from Soros. I assume that there are other ways that Soros has given money to FCIR, but this seems enough to me. Oh great! I guess Mediamatters has a new go-to source for "objective" gun crime statistics! Is Rebecca Peters on the board of this publication? Talk about an Orwellian reality! This is the kind of thing that drives otherwise normal people into conspiracy theories. What will they do next (these evil people with their billions of $) buy whole universities?